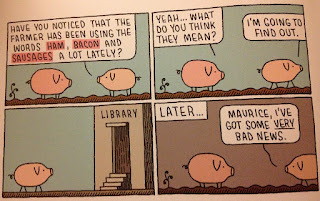 Tom Gauld is a Scottish cartoonist who draws a weekly comic for The Guardian. His first graphic novel, Goliath, which tells the Biblical story of David and Goliath from the point of view of the Philistine giant, was very well received. 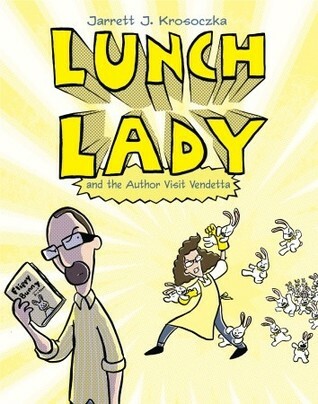 This is his second graphic novel, though it is really a collection of his weekly comics and not a unified narrative. As you can readily see, Gauld is a master of one page funnies. His one panel gags are excellent, and his other short stories told in panels are well paced in terms of action and punchlines. 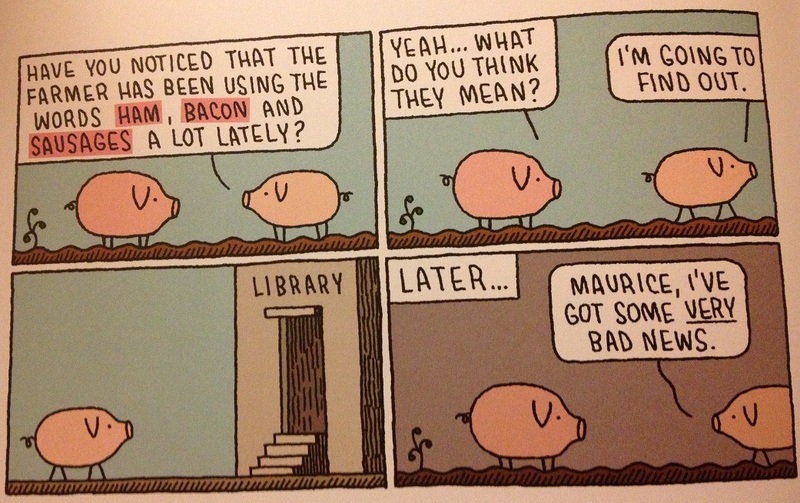 I feel his line work is simple and elegant and rates up there with other comic virtuosos such as Gary Larson, Kate Beaton, Edward Gorey, and Nicholas Gurewitch. 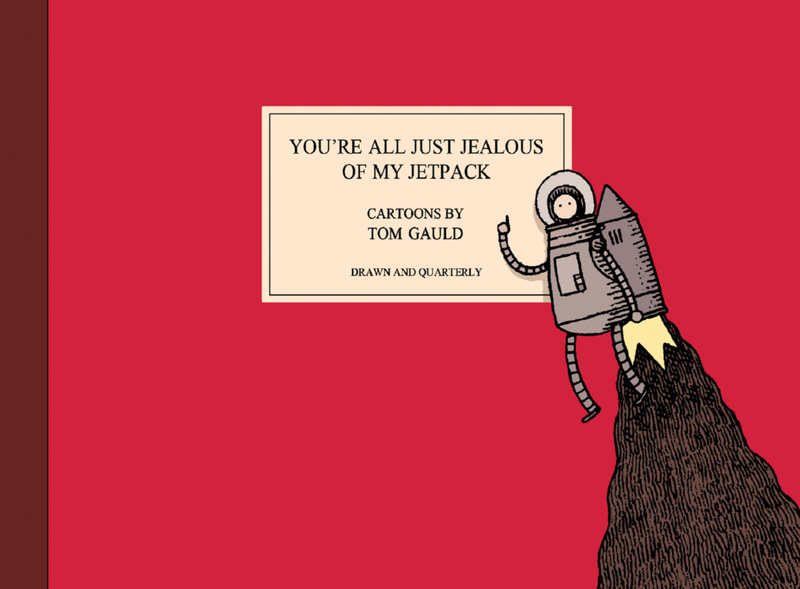 Gauld regularly shares his artwork on his tumblr. He also speaks more about his work and career in this interview. Reviews I have read about this book have been very positive. 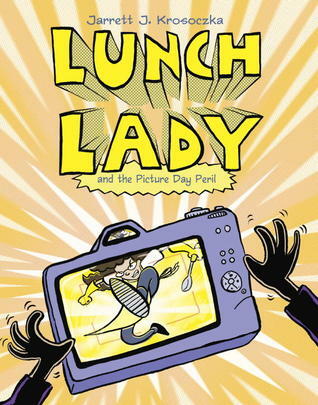 The School Library Journal's Angela Carstensen praised it as "breathtaking and delicious." Boing Boing's Mark Frauenfelder wrote that Gauld's comics are "presented with a sense of graceful whimsy that makes his work such a delight to read." Paste Magazine's Hillary Brown summed up that this book "is awfully pessimistic and awfully cheery at the same time, which is exactly what a short-form newspaper comic should be." 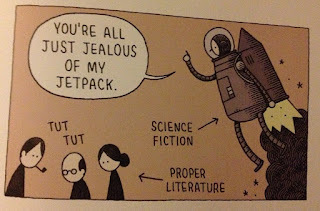 You're All Just Jealous of My Jetpack is published by Drawn & Quarterly. They provide a preview here. Storied and influential comics editor Kim Thompson died June 19, 2013. The list of works and artists he had a hand in bringing to American audiences is long and way beyond impressive. 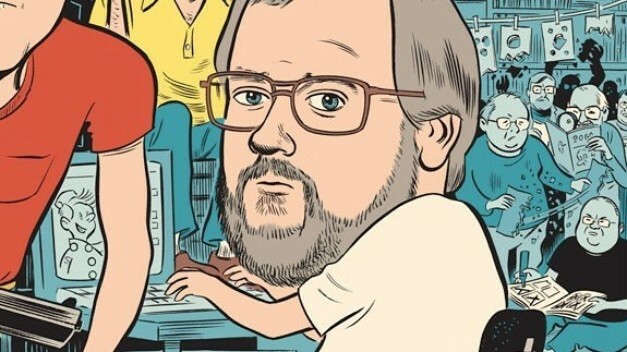 I got to know him from his writings in The Comics Journal in various media and also from his caricatures from comics I loved and worshiped while I was an impressionable reader, including Hate and Eightball. 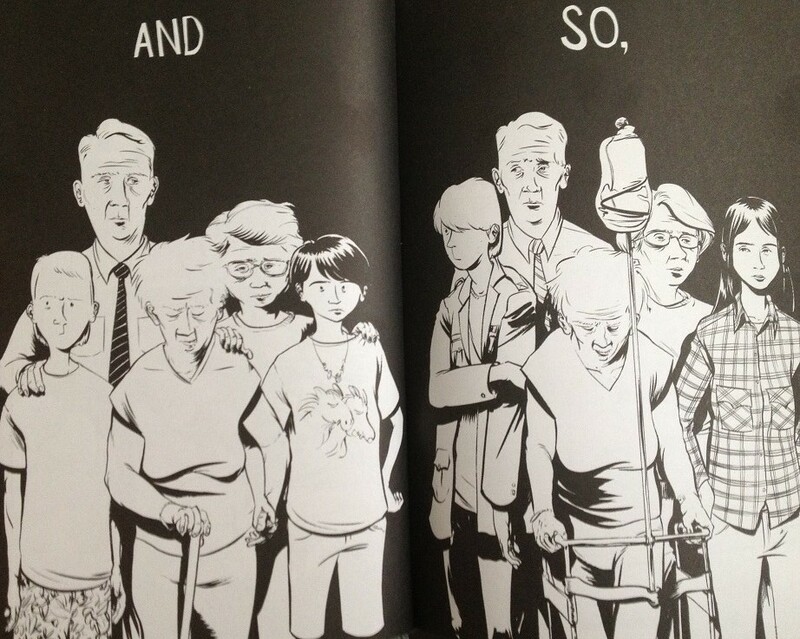 I cannot put into words my appreciation for all he did with his life and how much he was a cornerstone of what I consider the best publisher of US comics, Fantagraphics, home of Love and Rockets and so many other excellent works, so I will link to some of the most affecting words I have seen from others. This laundry list of tributes from those who knew and worked with him is very heartfelt, funny, affecting, and wonderful. Bully, Your Friendly Neighborhood Stuffed Bull, has a great look at his personality as well as his Marvel Comics fanboy past. This obituary by long-time friend and partner-in-crime Gary Groth is available at the Fantagraphics website. Tom Spurgeon has a comprehensive list of remembrances, tributes, and related writing about Kim Thompson over at The Comics Reporter. Spurgeon also offers a most comprehensive obituary/appreciation here. Ray Bradbury's The Martian Chronicles is a collection of short stories about an alien world. Originally published in 1950, these stories tell tales from 1999 until 2057 about the people who have chosen to explore, inhabit, and eventually overtake the Red Planet. They are ripe with symbolism, humanity, and philosophy and are considered classics of science fiction and 20th century literature. I have to admit I only came to the novel collection of these tales a couple of months ago after Bradbury's passing, and I was struck by how striking, lyrical, and expressive they were. Bradbury won multiple honors over his life, including the prestigious National Medal for Arts and being named Science Fiction Poetry Association Grandmaster, and he was no stranger to having his works adapted into comic books as early as 1953. This authorized adaptation was done by Dennis Calero, a Harvey Award nominated artist who has worked on various comic series including X-Factor for Marvel, Supergirl and the Legion of Superheroes for DC, and adaptations of Kolchak: The Nightstalker for Moonstone. He also collaborated on the webcomic series Little Green God of Agony with famed horror writer Stephen King. The stories here begin with a vignette from the point of view from the Martians, who have no awareness that there is even life on the third planet from the sun. From there, we see a number of expeditions as the Earth people try to learn about the Red Planet and its inhabitants. These expeditions meet with varying degrees of success. 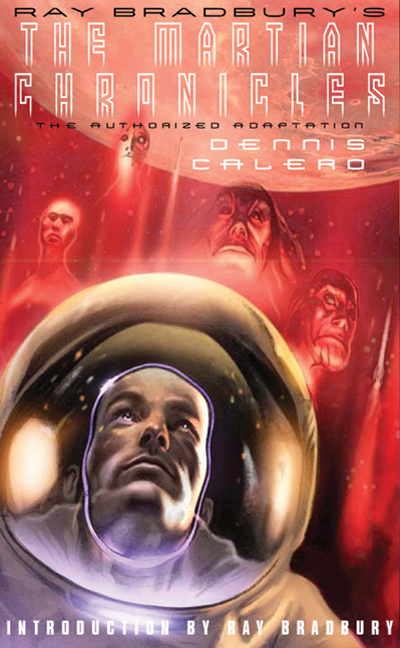 From there, the stories are about the consequences that accompany the enterprise of traveling to Mars for the Martians and the Earth people, with some excellent commentary on colonialism, commercialism, and humanity in general. I won't say that I am completely blow away by the artwork, but it is professional and competent, adapting the short stories into a visual medium in ways that convey the narratives, use sequential art to good effect, and still preserve the flavor of wonder and awe of Bradbury's writing. I feel this book is a good vehicle for building an appreciation of these classic tales of science fiction exploration. Reviews I have read about this book have ranged wide, from positive to lukewarm to largely negative. Ryan Crawford was somewhat disappointed that this book did not adapt every chapter of the original (it only covers 14 of the 28 stories in the novel), but he sees some bright spots in Calero's work, especially his work on "The Musicians." The Forgotten Geek was largely disappointed in this adaptation, summing up, "Nice try, but unnecessary." The book also has a number of positive reviews from various readers at Goodreads. Ray Bradbury's The Martian Chronicles is published by Hill &Wang. The story here is a well known Indian legend written sometime after 300 BCE that has retold many times and ways. This essay touches on the many versions of this tale, with particular attention to what makes this version particularly unique. Here it receives the graphic novel treatment, and the basic tale is that Sita is kidnapped away from her husband Rama by a demon king who says he loves her. This event leads to a conflict between Rama and the kingdom of Lanka, and Rama enlists the aid of his brother and best friend, Lakshama, to combat the demons and free his wife. Sita receives some assistance and comfort from Hanuman, a monkey ally of Rama. As you can probably tell from the images, this tale draws much from Hindu iconography in its depictions and presentation. I feel that the artwork is colorful, rich, and beautiful, though it is a little clunky at times in sequential art terms. This book was a collaboration between writer Samhita Arni and scroll Potua artist Moyna Chitrakar. More about the creators' intentions in retelling this legend in this book can be found in this article. This beautifully rendered book has won a few awards, including being named one of Booklist's Notable Children Books for 2012, an ALA Notable Children's Book, and also receiving a South Asia Book Award Honor. It should come as no surprise then that it has been well reviewed. Booklist's Francisca Goldsmith called it "a bit of a feminist retelling" but added, that it is "a fine addition for both youth and general collections, reading groups, and curriculum-planners interested in diversifying foreign literature, art-book, and ethnic studies reading." R. Krishna enjoyed the story fine but ultimately decided "what ultimately stands out is the book’s art form." Kirkus Reviews positively concluded that this book is "A valuable piece of historical literature brought to the forefront for thoughtful new readers." 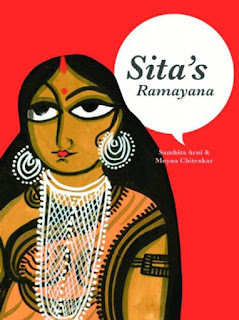 Sita's Ramayana is published by Groundwood Books. Swallow Me Whole won an Eisner Award and Ignatz Award and was a finalist for the Los Angeles Times Book Prize when it was published in 2008. 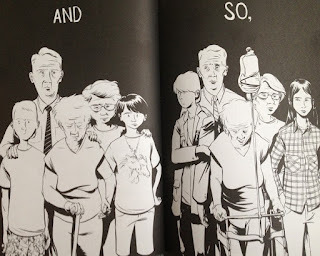 It was an impressive debut, and its creator Nate Powell has gone on to great a good number of excellent graphic novels since, including The Silence of Our Friends, Any Empire, and the forthcoming collaboration with congressman and civil rights icon John Lewis March. He has had a variety of experiences, working for a decade with developmentally disabled adults, managing a punk rock record label for 16 years, and also playing in some bands. Powell speaks extensively about his work on Swallow Me Whole in this 4-part interview with the Daily Cross-Hatch. The book tackles some complicated subject matter, focusing on a duo of adopted siblings dealing with their own mental issues in poignant and human manner. The book is also disturbing, murky, and baffling, an attempt to portray what is going on in their minds via the art and story. Perry has delusions about a wizard who compels him to draw. He tries to drown the voice out of his head or ignore it completely, but these both prove difficult. Ruth is compulsive and collects cicadas and other insects in formaldehyde jars. They swarm, buzz, and also communicate with her. She also has dissociative episodes where she loses blocks of time while focused on some task or idea. Additionally, their grandmother "Meemaw" is also at home, dealing with her own dissociative situations and needing looking after. Of some comfort is that Perry and Ruth have each other to lean on and confide in. They are very troubled but loving of each other, and their family does its best to cope with the various situations, even if the tasks are wearying and frustrating. Also, there is a parade of well meaning but sometimes limited figures who deal with the various episodes, doctors, police officers, teachers, counselors, and school administrators. Some are more successful or well-meaning than others. The complexity of dealing with mental health issues is shown in realistic, difficult, and heartbreaking accuracy. The interplay between reality and madness is what makes this book work so well for me. It makes for compelling and revelatory reading, leading to a devastating and dreamlike conclusion that begs rereading. I won't call the book enjoyable but it is powerful and wonderfully composed. Reviews of the book point to its craft and complexity and praise Swallow Me Whole as an excellent debut. Seth T. Hahne commented that "the climax is amazing and, whether taken literally or figuratively, demonstrates well Powell’s grasp of the material. Great stuff!" Andrew Wheeler wrote that "Powell’s art has immense immediacy and energy" and that this book is "clearly a major work by an impressive young cartoonist." Brigid Alverson concluded, "This is not an easy book to read. It is a very good book, and worthwhile reading, but it is not a pleasant book." 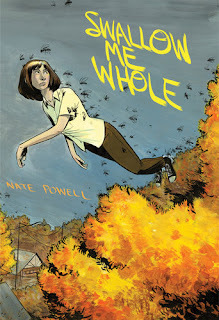 Swallow Me Whole is published by the fine folks at Top Shelf. They provide reviews, excerpts, and all kinds of other resources here. Primates is a melange of three biographies of female scientists joined by their research interests in the great apes and the roots of their academic work. All three all began getting their funded projects through Louis Leakey, a huge figure in the search for the ancestry of humankind. He felt that women were especially suited for scientific work beyond men because of their patience and ability to perceive differently. He also had a wandering eye, which complicated his marriage and also perhaps led to some of the attention and opportunity he gave this trio. Dian Fossey studied gorillas and found them gentle and noble herbivores, not at all like typical media depictions as monsters like King Kong. Does that look like a monster behind her? She was the expert on gorillas when she was alive and their most strident defender against poachers, which led to her untimely demise. Her work goes on via The Gorilla Fund. As with the others her stories focus on her experiences roughing it in the jungle and also dealing with relationships with other people in such settings. Primates is the creation of writer Jim Ottaviani and Maris Wicks. Ottaviani has written a number of great graphic novels about scientific inquiry including ones about the early days of paleontology, the space race, physicist Niels Bohr, women science pioneers, and the more recent biography Feynman. Wicks has drawn a number of comics and minicomics, including Yes, Let's. She blogs about her work and also has a tumblr. This article sheds more light on both of their takes on this book. Musk and screaming: not scary at all. Because of the brevity of the book, volumes of research and decades of work are deftly distilled into a small space. Nevertheless, this book serves as an excellent introduction into the work of Goodall, Fossey, and Galdikas that could inspire further reading or study of other primates (there's all kinds of further resources listed, too). I am especially struck by how well it demonstrates connections between the seemingly disparate fields of anthropology, archaeology, and zoology. This book is as much about how science works as it is about the works of specific scientists. Reviews of the book I have read have been positive. Carl Zimmer of The New York Times expounded on the work of these women and praised this volume as " the kind of book that can produce new scientists" because of how it captures the joy and work of discovery. Kirkus Reviews summed up that it "provides an accessible introduction to Goodall’s, Fossey’s and Galdikas’ lives and work." Tasha Saecker at Walking Brain Cells called it "a stellar pick for school libraries and public libraries that will have children learning about scientific history without even realizing it." 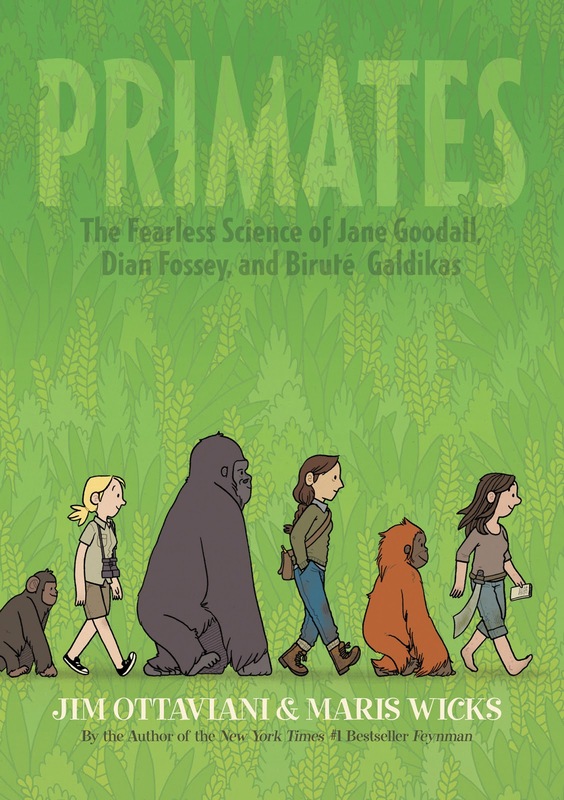 Primates is another excellent graphic novel from the fine folks at First Second. They provide previews and a lot more here. A big thank you to Gina for the preview copy! And a big thank you to Ottaviani and Wicks, who I met at HeroesCon this past weekend for signing my copy of this book. They are super nice and talented! 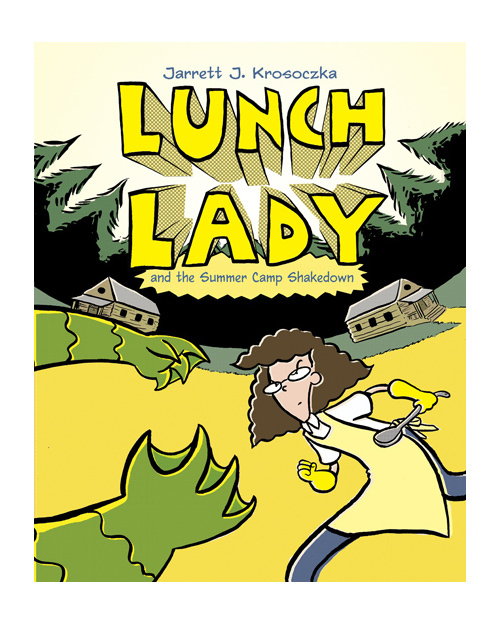 I have read and reviewed the first two volumes of this series in the past, and as luck would have it, the author Jarrett J. Krosoczka attended the 2013 Children's Festival of Reading in Knoxville. He has been busy working on the series, because now he is all the way up to a ninth volume. The newest one, Lunch Lady and the Video Game Villain, was sold out by the time I got to the book counter but I did snap up the volumes in between. 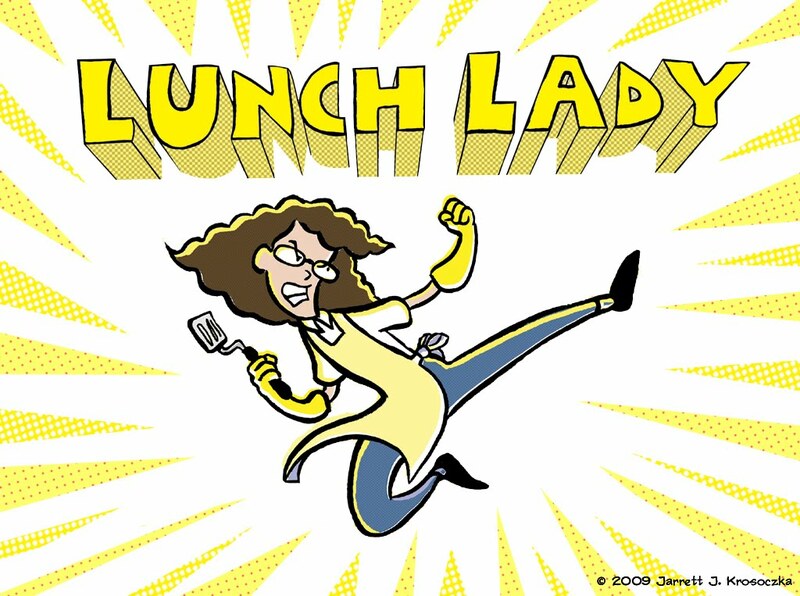 The set up, in case you don't recall, is this: by day, Lunch Lady works at the school with her fellow "lunch engineer" Betty, who designs many different culinary-based gadgets, like night vision tacos, fish stick nunchucks, and spork phones, that are useful in their many adventures. By night, she defends the school and its students and teachers from various menaces, which there are a lot of at this school, from crazed cyborg attacks to crazed librarians. Lunch Lady handles all these situations with skill, humor, and aplomb. She is a smart, fun character, and it is hard for me to dislike a heroine who uses exclamations like "Good gravy!," "Great goulash!," and "Oh my tater tots!" 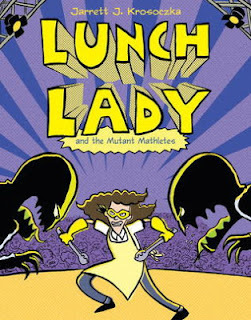 Also, there are three other characters that factor largely in these books, the Breakfast Bunch kids, Terrence, Dee, and Hector, who assist Lunch Lady when they can and have to deal with the local bully Millmoe. 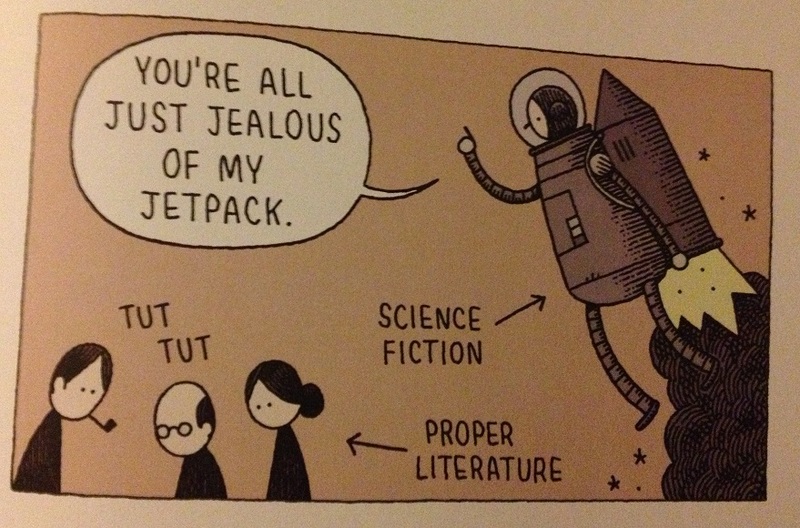 These characters offer readers more relatable viewpoints and some comic relief as well. In this third volume, Lewis Scribson, a finicky author comes to school to read and autograph his books. He will not eat the cookies Lunch Lady has baked for him. He will not sign copies of his own book if they have wrinkled covers, which bothers one of his long-time fans who has a cherished and well thumbed through volume. And he resents having to do his presentation in the gymnasium. After his visit, the PE teacher mysteriously has vanished, which leads to two questions: What did the author have to do with that disappearance? and Is playing dodgeball the best method to deal with an army of Flippy Bunny dolls? 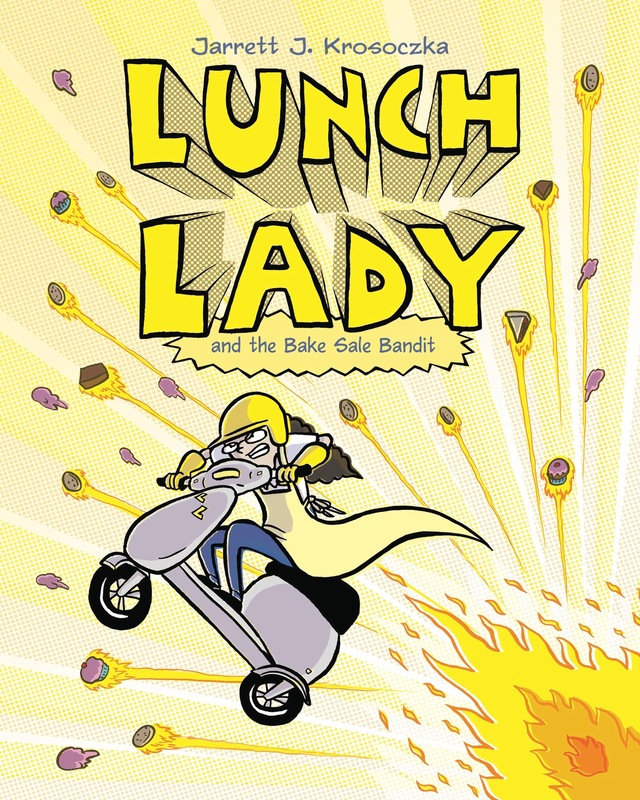 Lunch Lady tries to take a break in book four, because what could possibly go wrong at a relaxing summer camp? Aside from farts and other assorted smells and bodily functions that are accentuated by staying in summer camp cabins, there is also the matter of a swamp monster roaming about. Initial research points toward it being some kind of new lifeform, but its ability to go into a kitchen and pilfer ice cream sandwiches indicates it may just be a person in a suit. The various camp counselors provide lots of alternatives and red herrings about who is terrorizing everyone and threatening all of the fun activities planned for the next two weeks. It could not be the dreamy new counselor Ben, with his blond hair and guitar, could it? 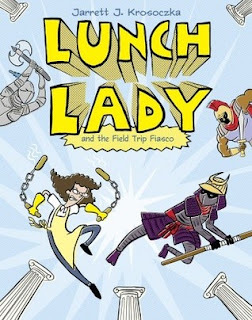 Lunch Lady is an art aficionado, and when one of the chaperones falls sick she gets enlisted to accompany the students on their trip to the museum. The Breakfast Bunch wander off by themselves and learn that there are a surprising amount of fake pieces of art on display. The new museum director Dr. Fraudwa is apparently up to no good, and he does not take kindly to their snooping around. It's up to Lunch Lady to crack the case and save the day, but she may be too distracted by the museum tour to be effective. After cutting out on part of the field trip, the Breakfast Bunch has to join the after school math team. With their added brain power, the team steamrolls their way to the championship against the private school Willowby Academy, which has not lost in more than 20 years. After Lunch Lady and Betty figure out that there is no trace of the Willowby mathletes once they win their championships and the fact that they all have the same green eyes, they decide to break in and investigate their rival school. This action puts their crime-fighting secret identities, and lives, at risk. Finally (for now), it's picture day at Thompson Brook Elementary School, and the ultra-chichi photographer Stefani DePino has come to immortalize the students. Strangely, many of them have broken out in acne at the worst time. 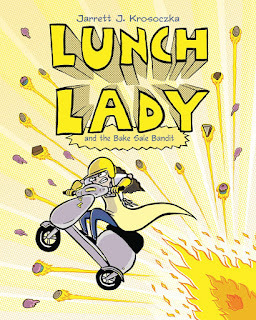 Lunch Lady and Betty investigate and learn the cause of this malady and also its link to tabloid magazines. Along the way, we learn about missing student council funds as well as who would in a fight between two cafeteria workers and a posse of fashion models. As you can hopefully glean from my summaries, these stories are pretty silly. They are full of corny jokes, puns, and comic book action. They are also quite a lot of fun. The images are crisp and clean, and the use of yellow tones throughout accentuates things nicely. Author Jarrett Krosoczka has an obvious love of comics and uses their conventions to great effect. He has a few other works, including the picture books Max for President and Ollie the Purple Elephant and the recently published chapter book Platypus Police Squad. Krosoczka speaks more about his creative process in this interview. This series of books rolls on to great reception. It has twice won a Children's Choice Book Award and also received high marks from Common Sense Media. Kirkus Reviews calls them "agreeably silly" and "action-filled." There has even been talk of a live-action movie starring Amy Poehler, though nothing has come to fruition yet. 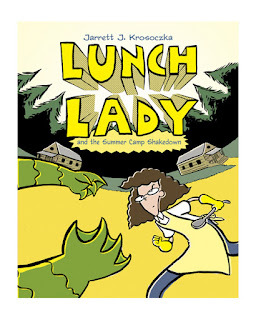 Previews, a Lunch Lady video game, interviews, and much more are available at Krosoczka's official webpage.